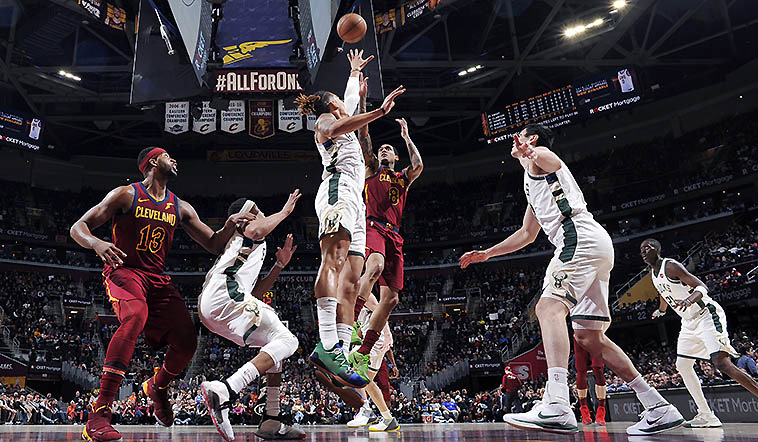 The Cavs post All-Star break fight to be show growth down the stretch continued on Wednesday night, as the team took down the top seed in the Eastern Conference, topping the Milwaukee Bucks 107-102 at the Q. Yes Milwaukee was playing without a couple of their key players, including Giannis Antetokounmpo, and the Cavs took advantage of it winning over the Bucks for the first time this season. Once again Collin Sexton was the best player on the floor for the Cavs, as he put in 25 points to lead all scores for the Cavs, including shooting 10-of-18 from the field with three assists. The win puts the Cavs at 19-53 on the season, 13-24 at the Q. The team is off on Thursday and will be at home against the Los Angeles Clippers on Friday night. Collin Sexton continues to shut up those that were saying ‘bust’ for the young rookie early in the year, as he was effective again, and down the stretch put in two huge buckets to seal the win for the Cavs. First he hit a three with 1:42 left and about a minute later went in for a driving layup that helped the Cavs keep the lead late in the game. On the night he scored a Cavs high 25 points, and he became the only rookie in team history to score at least 23 points in seven straight games. Austin Carr did it six times back in 1972. The youngster also became the first NBA rookie to score 23 points in seven straight games since Tim Duncan. He’s quickly looking like a star in the making for the wine and gold. The Cavs finally got some injured players back, as Larry Nance Jr. took the floor on Wednesday night, but the big return was that of Tristan Thompson, who was finally back on the court after missing 26 games with a sore left foot. Thompson logged 12 minutes with seven points and six rebounds, and Nance coming back off a rib injury, played 23 minutes with seven points, seven rebounds and five assists. “I was hoping we would have gotten him back sooner,” Cavs coach Larry Drew said of getting Thompson back. Hopefully everyone on the Cavs can stay healthy because it would be fun to see what this unit can do all healthy. The Cavs are playing spoilers as of late, as Wednesday they stopped Milwaukee from clinching the Central Division sending them to 53-19 with the loss. Monday night they beat Detroit in a home win, a Pistons team that entered Cleveland as the 6th seed in the East, a blow to them with that setback. Don’t forget back on March 11th they topped the Raptors, also at the Q by a final of 126-101. It’s kind of fun after being beat up the entire season by everyone else that the team is finally getting some revenge on everyone else. They have some key games against more playoff teams in the last few weeks, let’s see if they can again keep playing spoiler to other teams.